My microwave died this past week. In its honor, I'm rerunning this classic post from my old LiveJournal; it was originally posted on 25 March 2010, during my bachelor days. When in Cincinnati for spring break, I happened to mention to my father that my microwave (which attentive readers will recall has been having problems almost since I got it) had finally ceased working beyond my capacity to repair it. "You should buy one on Craigslist!" he replied. He's been on a bit of a Craiglist kick of late. Within seconds he was on his laptop, searching "microwave" in the Cincinnati area to demonstrate how easy it was. Before I knew it, he was proclaiming that he was going to buy a microwave: he'd discovered the same one that he already owns for a good price. 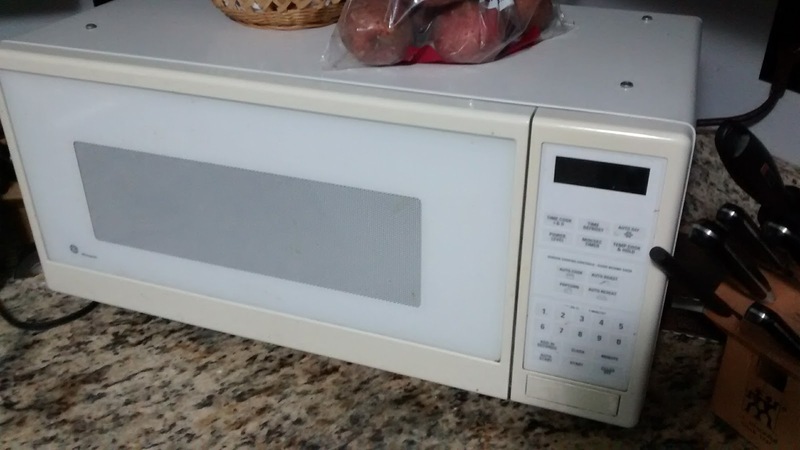 The cabinets in the kitchen have a slot built to precisely accommodate this microwave, so he can't replace it with a different model, and what would he do if his broke and the model had been discontinued? For $25, he could chance a used replacement to keep in reserve. A couple hours later, he owned the microwave. But, my mother told him "no": it didn't have the turntable. He wanted to sell it to me. My mother told him "no" again: "just give it to him." Actually, he wanted to charge me a markup for travel expenses. That's my dad for you. When he went to pick it up, the guy whose microwave it was asked it my dad had had any trouble finding the place. No, my dad answered, because it was near where he used to work at GE. Oh, said the guy, and asked if my dad knew some people whose names he rattled off. My dad did know them, sort of: they had all been company bigwigs back in the day. He asked the guy how he had known them. The guy explained that his dad had done some consulting work for GE back in the day, coming along to help close hard deals and such. He'd been an aeronautics professor at the University of Cincinnati in the 1980s. Who was your dad? asked my father, thinking that as he'd attended UC for mechanical engineering (and had done jet engine stuff), he probably knew this guy's dad. "Oh," said the guy, "my dad was Neil Armstrong." I now own the microwave of the son of Neil Armstrong. Neil Armstrong probably ate a Hot Pocket out of my microwave! I've named it the Eagle. Well, the Eagle has landed for the last time. Godspeed, Neil Armstrong's son's microwave.